Caracal hissing and baring its teeth to keep jackals away. 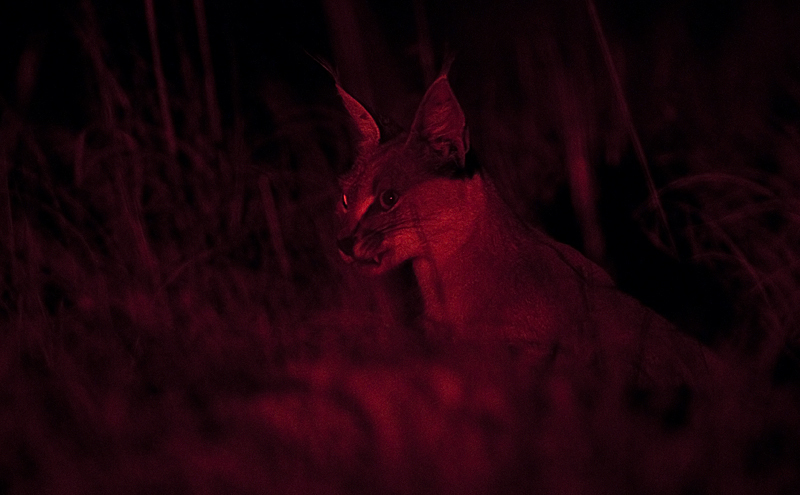 The red light is not visible to many animals and is useful to watch them behave naturally in the dark. Like I mentioned in a previous post, carcasses are interesting places to see interaction between scavengers. 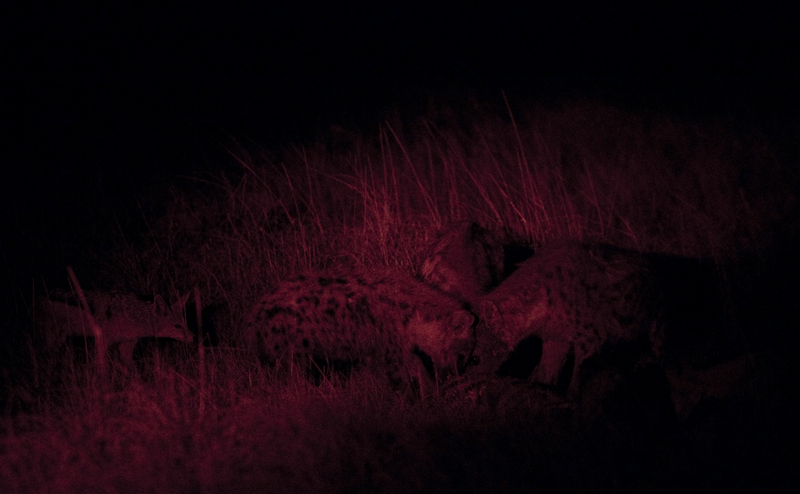 The daytime scavenging activities may be dominated by those quintessential scavengers – vultures – but nighttime scavenging is whole lot interesting. On late April afternoon, we discovered a carcass of a young zebra foal inside a natural waterhole on the edge of the Etosha pan. It is an important watering point for animals and the suspected cause of death was disease, because the body was in the middle of the shallow pool without being opened and with no predator present onsite. We called in the park staff, who swiftly removed the carcass and dragged it away into the surrounding mounds. After sunset that evening, I was given permission to accompany a predator researcher who wanted to document scavenger interaction at the site. We were expecting to see jackals on the carcass, with perhaps a hyena or two but when we arrived at the scene we saw something very unexpected. The carcass was placed in a place with tall grass all around and it was completely hidden away from the road. When we reached the carcass, it was already dark and we couldn’t see anything at the site. Interestingly, there were six or seven jackals around and they seemed to be ‘waiting’ rather than being on the carcass. Jackals may not be able to open up a zebra fully, but they do go for softer body parts, so it did look strange. We switched off the car and the headlights and began our wait. With the noisy engine shut down, I could instantly hear purring from the carcass which was perhaps about ten feet from us. The biggest cat that can purr is a cheetah, although lions and leopards can do similar sounds (but is technically not purring as far as I know). Cheetahs are extremely rare in that part of Etosha, so it was intriguing to know what animal it was. The researcher, who is Deaf (note capital D. Deaf culture people believe deafness is a different experience and not a disability and they are awesome! ), was busy preparing her notebook when I tried to signal to her that I could hear something. I was not able to make much progress, but that was not required as a cat popped out in the grass to look at us. It was a caracal! A lot of animals cannot see red-colored light very well and to see them behaving naturally without the bright white lights, some predator researchers use lights with red filters on them. We quickly switched off the car’s headlights and turned on our red-filtered search light. The caracal went back to eating, purring in its feeding frenzy. It was amazing to see that an animal not much bigger than the jackals themselves could keep seven of them at bay as it ate alone. Seven! 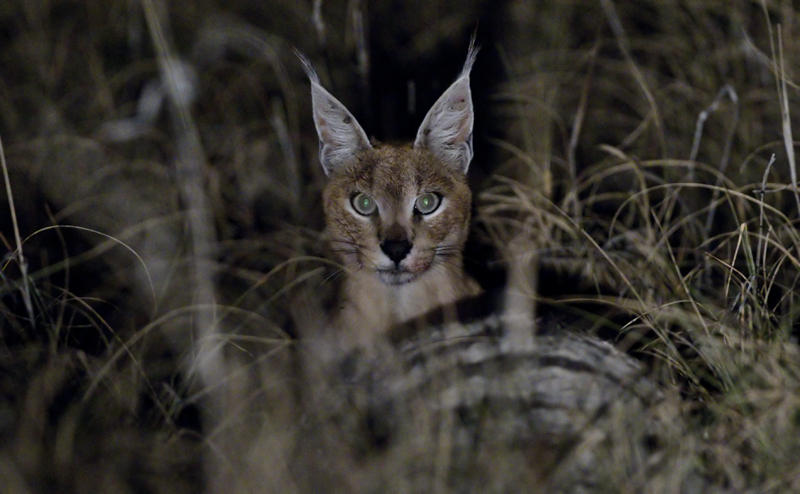 The caracal’s feeding frenzy continued for perhaps half an hour or so when the quietness of the night was broken by an unmistakable whoop some distance away. Hyena! Or hyenas. Interestingly, the jackals suddenly started hounding the caracal, which bared its teeth and hissed at them. As we used the searchlight to scan the area for the source the hyena cries, we somehow lost track of the caracal as the next time we looked at the carcass, there were jackals all over it! It didn’t take long for the hyenas to make an appearance at the scene. There were three of them and they went to work on the carcass immediately. The quiet purr-y feeding of the caracal was in stark contrast to how the hyenas went about their business. The crushing of the zebra bones by that incredibly powerful jaws that hyenas are blessed with is a sound that must be heard in the quietness of the night to send a shiver through your spine. What powerful animals! The jackals had been relegated to secondary scavengers once again, but unlike their time with the caracal they were on far more friendly terms with the hyenas. It was quite amazing to see the jackals and hyenas feeding together on a carcass, and that they are not quite as selfish as you would expect them to be. After 45 minutes of watching hyenas and jackals eat, we heard lions calling! They seemed to be very very far away and we decided to go investigate in that direction. After half an hour finding nothing but countless springhares we turned back, and fully expected the hyenas to have finished off the carcass or at least made off with the spoils. 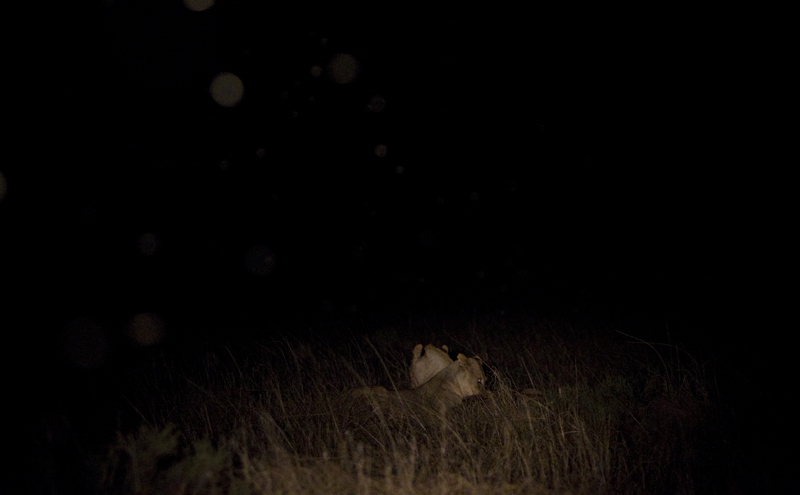 However, when we arrived at the scene, the hyenas and jackals had disappeared, and in their place were two lions! The lions growled and fought briefly before they settled down with their own share, as the carcass was fully broken up by now. Whether it was the hyenas that broke it down, or if the lions did it I do not know, but the raw strength that they have to break a zebra – split right down the middle – is quite remarkable. As the lions ate, my phone beeped to let me know that we had to start our twenty kilometer drive back to camp. Our permit allowed only four hours after sunset to be out in the park and that time was nearly up. Not wanting to leave the lions, but also knowing that they could be eating there the whole night, we had to just take a few pictures to identify them and start our drive back. Four hours was a very short time, but in the end those four event filled hours had flown by in a flash, as is all time spent in the wild. A caracal feeding on a zebra carcass. Hyenas and jackals feeding together on the carcass.